As a woman, I fulfill many roles – daughter, sister, wife, mother, teacher, nurse and the list follows. Each role that I embrace imposes upon me certain dictates. For instance, as a daughter I am to honor my mother. I also glean from her wisdom, and learn from her continued instruction. As a sister, I listen and encourage my sisters. We learn from and share our life experiences with one another. And, finally as a mother, I nurture, teach, doctor “boo boos,” and love my son as no other person can love him. However, the most important role I have is that of servant and child of the Lord. This is a role of submission, obedience, learning and humility. When I asked the Lord Jesus to come and live in me and be Lord of my life, I submitted all of me to Him. This submission placed a yoke upon me, as no other role I have to follow. A yoke, according to the Dictionary.com, is something that couples or binds together; an emblem or symbol of subjection, servitude, or slavery. My first instinct is to resist this yoke. Much as oxen resist the yoke placed upon them, I have the same urge to shake it off and to rid myself of it. It is heavy, and I often look at it as a burden that I cannot carry. However, as I ease into the yoke and accept it – ever yielding to it – I find comfort and security in it. Lamentations 3:27 says, “It is good for a man to bear the yoke in his youth.” After reading that verse, I thought it did not apply to me. I am no longer a youth, and could not see how the verse could be applied to me. As I considered it and prayed about it, I then replaced the word “youth” with the word “beginning.” As I looked at it that way, I began to see that the yoke is foundational – it contains me and keeps me from wandering. It was necessary to place it upon me, in order for me to grow and mature. The yoke is becoming lighter and easier to bear, as I recognize that my submitting is needful, and so it has become a comfortable place – one I enjoy. Jesus said in Matthew 11:29 and 30, “Take My yoke upon you and learn from Me, for I am gentle and lowly in heart, and you will find rest for your souls. 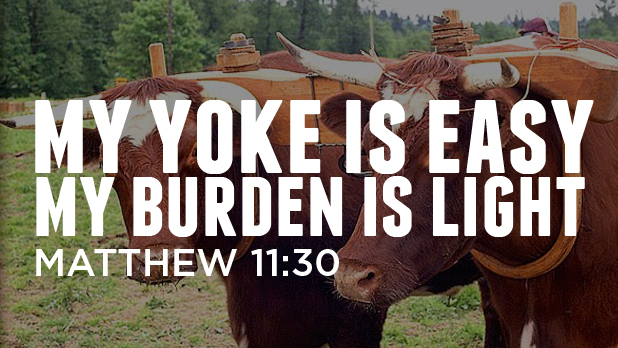 For My yoke is easy, and My burden is light.” What a joy it is to take on and submit to His yoke. I am now longing for and desiring it. His teaching is faithful and true – His yoke is easy for me. Submitting to the Lord is uncomfortable at first, because we have to put away the sins that keep us from serving Him faithfully. Think of an uncooked egg – when you crack it open, you can see that the yoke is holding it all together; however; when you break that yoke, it falls apart. When we shake off the yoke He has placed upon us, we fall apart too. I do not enjoy being all mixed up like that egg. When you start to recognize that the yoke is not meant to hurt you, but it is to guide you and keep you secure, it is easier to bear it, and becomes a joyful experience. I cherish the many roles I fulfill every day and I humbly thank Him for each role He has entrusted to me. My prayer is that the Lord will continue to instruct me and allow me to bear His yoke. I encourage you to not be fearful or reluctant to submit to His yoke for it will guide you faithfully as you serve Him.